To come up with words to describe the adventure Explore Indochina gave me it is extremely difficult. “Totally mind blowing awesome” would be about as close as I could come. But that does not do the whole experience justice. I have travelled extensively and had many great holidays. If this was not number one it is certainly in the top three. 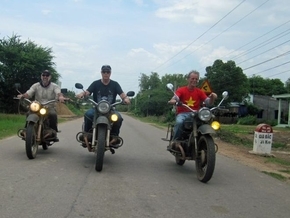 The guides and support crew were brilliant, the modified URAL bikes extremely fun, very appropriate and surprisingly comfortable, the accommodation superb, the group fantastic but most of all the ride through the Vietnam countryside was close to indescribable, so breathtaking beautiful on quiet roads for the most part. Driving the bikes through the mountains is a vision and memory I will never forget. The biggest feeling I had on the whole trip was of fun and awe. Everyone smiling and laughing. It hard to describe the feeling of being alone but with a great group that riding the bikes on an adventure like this gives you. The danger is real, the adrenalin pumps through the body. The near misses and unexpected encounters keep you alert the whole time. The sense of accomplishment at the end of each day when sitting around with friends having some beers and talking about the days sights and experiences is a pleasure that will last in my mind and heart for a long time to come. I would highly recommend this trip to anyone who rides bikes and wants the adventure of a lifetime….